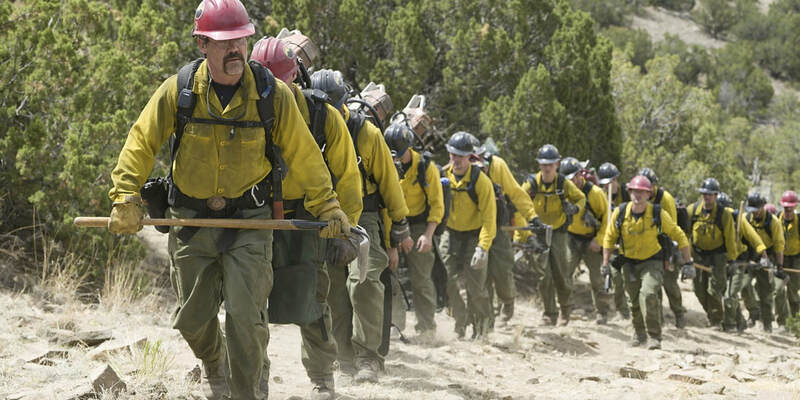 THE STORY - Through hope, determination, sacrifice and the drive to protect families and communities, the Granite Mountain Hotshots become one of the most elite firefighting teams in the country. While most people run from danger, they run toward it -- watching over lives, homes and everything people hold dear, forging a unique brotherhood that comes into focus with one fateful fire in Yarnell, Ariz. THE GOOD - Dazzling camerawork. Material-elevating performances. Not desperate when mining tears like say “The Impossible.” Joseph Kosinski is trying and the results are better. THE BAD - The pacing, as with Kosinski’s past outings, could benefit from being slightly faster​. Since his signature is high-flying and fetchingly rendered visuals, Joseph Kosinski doesn’t strike as a studio’s first, or even sixth choice to be leader of a story based on truth, one about the tragic circumstances that befell the elite 20-member Granite Mountain Hotshots during the Yarnell Mountain fire in 2013. As such, more proof is added to the pudding that the filmmaker's involvement in “Only the Brave”, is a nuanced punishment from filmdom’s powers-that-be for helming underperformed blockbusters. Or it might be less conspiratorial than that. A revisit to both his Halo 2's Starry Night and the beloved Gears of War's Mad World commercials indicates that Kosinski can meld groundedness with fantasy to create a singular and affecting mix. There is, however, a visible struggle to keep said mix registering the same way when the images now last for two hours; the stretching does turn Kosinski’s (Yet-again) consistently restful pacing into a threat to one’s interest when imagination-based stunners, like "Tron: Legacy's" light cycles or "Oblivion's" spherical drones of doom, aren’t around. But much like those two sci-fi films, Kosinski knows how to make the screen constantly appealing. No frame in “Only the Brave” film is boring thanks to an affinity for symmetry, as well as director of photography, Oscar winner Claudio Miranda’s ("Life Of Pi") acute emphasis on the shades that add to the narrative – the green and gold that liven towns, the blinding orange of the fire that threatens them, the smoke’s stifling mask, and the blackness that grants closeness to any two characters in need of it. Twice Kosinski gets to scratch his sci-fi tingle, it seems like, one with a helitanker refilling sequence that is staged like an alien abduction and the other being a recurring nightmare of a fiery bear running through a forest in flames. To Eric “Supe” Marsh (Josh Brolin, trading Nepalese snow for Arizonan fire, but still in contact with Buddhism via prayer beads), it’s a horrific tableau that comes to him nightly. To those who know what happened, it’s a depressing auguring. But prior to the point where dream regrettably becomes reality, we get to see Eric juggling the many pieces in his first-responder life like batting for his crew to become a “Type 1” first-into-the-fire unit, giving burnout Brendan “Donut” McDonough (Miles Teller, embodying the “American bum” archetype with aplomb) a second chance, and living up husband duties around wife Amanda (Jennifer Connelly, causing hearts to wrench with ease). Like mixing MSG into morning coffee, work at the station clashes with that at home and vice versa; the fires in the open induce a fever to those indoors. Both Brolin and Teller offer heartfelt performances when navigating the script’s paternity motif, especially in its aspect of reversing their absent-father status. “After we lost him, there were times that I’d tell my husband, ‘Could you just put a fire in the fireplace, I just need to smell Andrew for a minute?’” said Deborah Pfingston, mother of Andrew Ashcraft (Alex Russell in the film), to CNN in June. It’s a graceful measure to keep the Granite Mountain Hotshots immune to time, a purpose that Kosinski’s film fulfills with virtue. Even with conventional proceedings, what “Only the Brave” recounts is populated with beauty, respect, and zero manipulation.